A motto I've taught myself whilst organizing my music collection is to concentrate on a given release rather than an album. Releases are more specific than albums and have specific metadata and cover art that can vary between releases of the same album. How do I define release and album? A release is a distinct issue of an album (or single, live recording etc). Releases vary in different ways. An obvious variance is in geography. Different releases in different countries have different cover art, tracks and sometimes the tracks themselves even have different lyrics, depending on censorship laws and the like. Similarly, recordings are re-mastered and released at a later time period with improved audio quality. Again, the cover art and other data often changes. An album, meanwhile, is more abstract and is a defined collection of songs, artistically arranged (or not), that may be re-issued as different releases. This is an original release of an album, but country specific and re-issues may follow later, particularly if the album was successful. Cover art is an artifact of a CD's release. 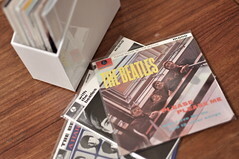 Therefore, you must search for the cover art of a release rather than the general album if you want to match your digital collection to your physical CD collection. Compare the cover art for The Strokes Is This It in the USA and in the UK. It becomes a little more subjective for 'year' data. For instance, if you were to buy the early 90s re-release of the 1971 classic Hunky Dory by David Bowie, do you want the album's year to be 1990 or 1971? When choosing music to play, probably the latter. Unfortunately many CD rippers choose to populate with the former. But what if you have both releases? The answer here is smarter MP3 tagging software. For all metadata other than year, think release, not album. For year, consider how you want to navigate and choose music. You may prefer browsing by year of original release of an album. Thanks to yoppy for the image above.